Pumpkin seeds are one of nature's almost perfect foods. They are a natural source of beneficial constituents such as carbohydrates, amino acids and unsaturated fatty acids. They contain most of the B vitamins, along with C, D, E, and K. They also have the minerals calcium, potassium, and phosphorous. Pumpkin seeds have mainly been used to treat prostate and bladder problems, but they have also been known to help with depression and learning disabilities. Because pumpkin seeds turned up so frequently in folk medicines, scientists began to conduct research on the oil extracted from them. One study showed pumpkin seed oil kept hormones from inflicting damage on the cells of the prostate, which helps to reduce cancer development. Another study revealed that the seeds contain a significant amount of L-tryptophan, which is beneficial in battling depression (although it is believed the seeds don’t have enough to treat major depression, they can be used as a preventive measure). Other studies showed pumpkin seeds can improve bladder and urethra function. And they are thought to help stop the formation of kidney stones, even though the ingredient responsible is unknown. Pumpkin seeds have also been used to treat learning disorders and are generally recommended in some countries as a ‘brain food.’ Other studies have shown they prevent hardening of the arteries and help regulate cholesterol levels. 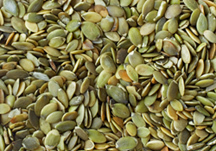 Using pumpkin seeds in cooking is popular in many cultures. Adding roasted pumpkin seeds to soups and salads provides a nutty flavor; and pumpkin seed oil can be used as a salad dressing when combined with products like honey and olive oil. Roasted pumpkin seeds are of course commonly eaten as snacks, but be aware that while roasting brings out their full flavor, the heat also destroys their natural fatty acids. Thus they are most nutritious when eaten raw. Also make sure to refrigerate pumpkin seeds so the oil does not turn rancid. When buying pumpkin seed oil it is important to check that the label doesn’t list too much sunflower seed oil. Some manufacturers add a lot of sunflower oil to reduce costs since extracting oil from pumpkin seeds is a tedious and complicated process. A common folk remedy in Germany uses pumpkin seed oil to treat tapeworms, although some say the act is somewhat risky. A person with tapeworms is given approximately ten ounces of ground pumpkin seeds combined with milk and honey. Two hours later, castor oil is given and the tapeworms are eliminated. Studies in China have shown that pumpkin seeds are beneficial to people with a rare parasitic disease received from snails called schistosomiasis. So far the disease has only been found in Africa and Asia. Pumpkin seeds have been known to cause upset stomach in some people, but they do not interact with other medications as far as anyone knows.